Sydney Airport parking offers a range of car parking options such as Short Term, Long Term and Quickpark to cater for travellers and visitors alike. Most routes to the airport have signs carrying the recognisable Aeroplane symbol. The symbol will point which way to turn at each intersection. Follow these symbols as they show the most direct route to the airport. Sydney Airport has opened its $65 million eight storey car park at the International Terminal which means there are now more than 4,300 car parking spaces available for passengers and staff. Short and Long stay parking is available. The car park is now accessible from both Departures and Arrivals levels. New lifts and Departures level footbridges provide direct and easy access to the terminals. Payment is via new automated pay stations which are conveniently located throughout the car park, offering short term and long term parking. Sydney’s International and Domestic Airports are located in close proximity to each other are approximately 8km from Sydney’s Downtown Central Business District, in the suburb of Mascot. 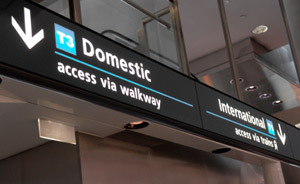 Access to the airport from the Sydney CBD can be made by hire car, taxi, bus, shuttle, train, or even cycling. The city is fairly well sign-posted with air plane icons directing traffic to the airports. Public transport too uses the symbol of a plane to indicate whether that bus will go via the airport. Sydney Airport is served by rail stations located at both the International and Domestic Terminals. The Domestic rail station is located directly between T2 and T3 Terminals and is accessible from within the terminals from the arrivals level. The International rail station is located at the northern end of the terminal and is accessible from the arrivals level. Airport Link is a fast and convenient way to reach the centre of Sydney (change at CENTRAL station for suburban stations). Trains run approximately every 10 minutes and the journey into the city takes only 13 minutes. The international and domestic rail stations link directly to the City Circle which means most city destinations are within a short walk of stations. Airport Link offer tickets (one way, per person) for passengers transferring between T1 International and T2/T3 Domestic Terminals. The journey takes only 2 minutes and there are frequent services between 5am and midnight, 7 days a week. There are several private shuttle services that run to and from the city (and even some suburbs). They depart regularly from the front of the airport terminals and cost approx $15 AUD per person for a one way trip into the city. It takes approximately 20 minutes to arrive in the city from the airport. This will depend on number of hotel stop-offs on the way. Some Airport hotels offer a regular airport shuttle service (at a fee). This service is not operated by the hotels however and cannot be pre-booked. The service runs approx every half an hour between the airport hotels to the terminals. Few if any Sydney city Hotel offers airport transfers. The City of Sydney is within a 30 minute cab ride of the airports in reasonable traffic conditions. Each terminal has its own sheltered taxi rank with supervisors on hand in peak hours to ensure a smooth flow of taxis. If you have any special needs, see the curb-side supervisors. They can organize taxis with baby capsules, wheelchair access, five-seater, station wagons for lots of baggage, and maxi taxis for groups. At T1 (International) bicycle racks are located at both ends of the terminal building. At T2 & T3 (Domestic) undercover bicycle racks are centrally located at 5th Street – adjacent to the public pick-up area. Departing passengers and Qantas flights 001 – 399. Tiger, Jetstar, Virgin Blue, Regional Express, Aeropelican, Air Link and Qantas flights 1600 and above. Security for passengers and staff is a top priority and Sydney Airport has spent $90 million to provide 100% checked bag screening. The security screening allows automated x-ray scanning of checked passenger baggage to prevent prohibited items from being loaded into the hold of planes. The system includes in-line x-ray units and conveyors. It is designed to screen thousands of bags every hour to make sure that there are no delays to passengers or flights. A further $2.8 million has been invested to upgrade the network of surveillance cameras that operate at Sydney Airport. Passengers are advised to watch at all times carry-on luggage and ensure it secured to their person and not tampered with. Sydney Airport - Known officially as Sydney Kingsford Smith Airport, it is Australia's most important and busiest commercial airport. Sydney International Airport was opened in 1920 and is one of the oldest continuously operating airports in the world. Sydney Airport covers 880 hectares on the northern shoreline of Botany Bay and processed almost 30 million passengers in 2009 (about 9.8 million of these were international travellers). Sydney Airport is built to handle over 17,000 passengers per hour through terminals T1, T2 and T3. A typical day at the airport sees 77,000 passengers through international and domestic terminals. The baggage handling system can handle 10,800 bags per hour. Sydney Airport, as of 2009, is undergoing a $500 million dollar upgrade to the International Terminal. The work is expected to be completed by late 2010. Sydney Airport is an important part of Sydney economy, directly providing 62,000 jobs and 108,000 jobs from flow on effects (around 8% of Sydney workforce) The total value of freight that passes through Sydney's terminals each year exceeds $33 billion.